I’m announcing something big today with my dear friend Lori Portka. So exciting!! 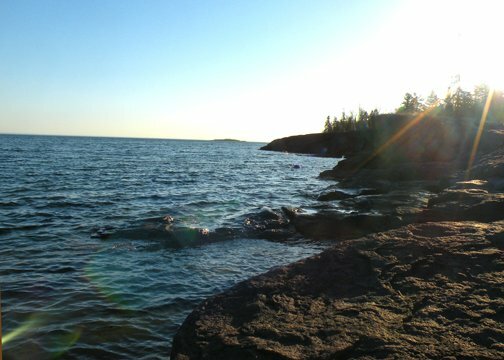 And it has me thinking about the moment in this photograph, a little over two years ago on the rocky shore of Lake Superior, when I knew my life was about to change. My intuitive abilities had been a closely-guarded secret most of my life, but the presence of spirits and angels had intensified ever since my dad’s death the previous fall. It was growing harder to keep everything I saw and heard under wraps. 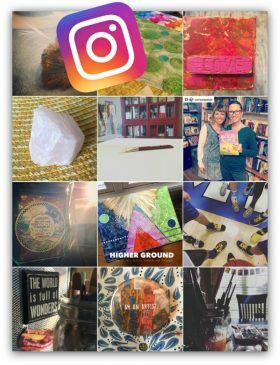 Within hours of arriving on the North Shore for a long weekend with dear artist friends, including Lori, they’d convinced me to do intuitive readings for each of them. One by one, each woman sat with me on the rocks and cried as angels, guides and loved ones on the Other Side came through. I could see healing happening before my eyes. And something clicked for me. Looking back, I can see that’s exactly what I’ve been given (so grateful! ): a clear path to follow and dear ones to help squelch my fears. 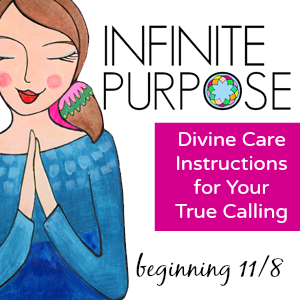 It’s been a heart-bursting journey, and I’m buzzing with excitement for what comes next: an inspired program for purpose-seekers and meaning-makers: Infinite Purpose: 8 Weeks of Conscious Creation. Spirit has provided detailed instructions for this event, right down to announcing it TODAY – (yep, on a Saturday) and, to my total delight, co-leading it with Lori. Squeeeeal! We begin November 8th and you’ll find all the delicious details on how it came to be and what it entails over here. That moment before your life changes? It’s here, friends.